A dominant anticyclone to the west, with associated cold fronts over the UK led to a fairly strong NW wind for the last in the Cockwells Tuesday points series. Race Officer Charles Choak, ably assisted by Paul Evans and snapper Malcolm Clark, steered Jack Penty and Noon Hi on a long chug to anchor north of Carricknath. 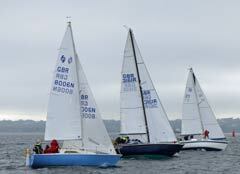 A long square line was set by “Mike the Rib” with extra scope on the pin as it was the top of a big spring tide. Seven U fleet were then off 5 minutes after with most of the fleet crowded round the long red canoe protecting Jack's stern. For some reason I got brain fright at the 1 min 30 second call from Matt and totally misread the start. Trifle was late and in danger of being stuffed off the line by Walter Amos in Poteen until a very cheeky Nigel Rowe in Kaimana tore in from windward and saved our bacon. We cleared the committee boat and immediately tacked onto port heading for the St Mawes shore. The way to go as I suspected the tide was running out in the channel. 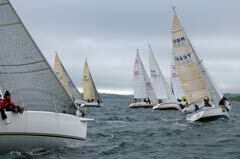 Most of the fleet came with us except Bob Chapple who took Wilkie out into the middle ground and sailed in clear air. 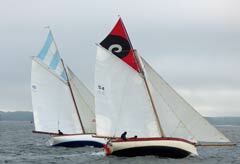 We were three up and set a no 1 genoa but with some skulduggery got the boat up to speed, balanced helm and pointing. 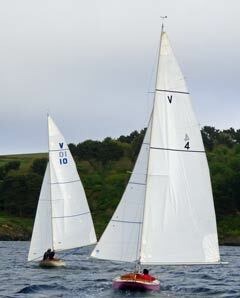 Two Sunbeams came out to do battle and stuck like glue to each other all the way round their course. In the event Saucy Sally beat Mary by 2 seconds. Len Cheshire has changed perfume and was joined by Mike Chard in Puffin and Guy English in Levity for a 3 boat W fleet. Len eventually beating Levity by just over 4 minutes with a bedraggled Mike 3rd on handicap. 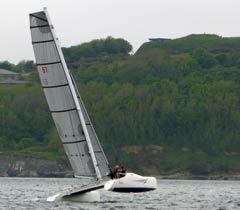 Arthur Williams (not really, he's still not afloat, though he did manage to sink a few beers later) in Winnie was joined by Dan Tregaskes in Grace for a good two boat B class thrash. We were on a spinnaker run when the two of them came past on starboard tacks. It was like a roll of thunder as one or both tacked behind me. The cacophony of numerous sails releasing and flapping. Then snapping to the new tack indicated the power generated. Grace beat Winnie both in the race and the series. On Trifle we got past the narrows and decided to make a break for the western shore as we could see Popincoota, Alan Grose on a lifter going that way! We followed suit and saw Wilkie coming up to join us. We were 4th round Vilt behind Popincoota and Wilkie. A rapid kite hoist with starboard pole gave us a much needed speed boost. We then did a gybe onto port pole and took our leave of the fleet. 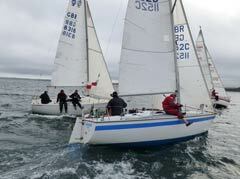 Carricknath was the leeward mark and we were dead downwind heading straight for it. There was an occasional sail by the lee but tracking the rhum line paid of, as we were 2nd round the mark. The beat back to Trefusis saw the wind drop as we came under the lee of the land. 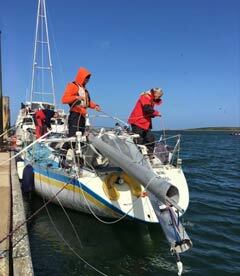 Another starboard kite hoist followed by a gybe saw us tracking toward Pendennis. That rounded we beat back to the finish getting 2nd place behind Gap Year, Len Trenoweth (with new crew, while Annie devotes herself to GCSE revision) and winning the series by 6 points to Wilkie with Kaimana a well earned 3rd. Excelle, Toby Fox, freshly launched with gleaming antifoul was first on handicap beating Encore, David Cunliffe and Rampage, John Hicks in Q class. Scorpion now aboard a ship minus her twig won the series ahead of Encore with Temeraire 3rd. Len in Sweet Friday won the series followed by Puffin with Levity 3rd.